It’s no secret that the insurance industry has lagged behind most other industries in its adoption of technology. On the carrier side, regulation and the need to protect sensitive consumer information has caused insurers to only implement technology when they are relatively certain that they are protecting consumer privacy. And with good reason. One only need to look at the recent breach of health insurer Anthem to see the dangers inherent in housing this data online (confidential information for over 80 million individuals was exposed to hackers). For insurance agencies, there are other impediments that have slowed the implementation of business technologies. In the agency distribution channel, most insurance agencies are small businesses. Until the fairly recent availability of technology delivered affordably in the cloud, many agencies didn’t have the capital to invest in expensive technologies. Now that cloud-based technologies are ubiquitous, many agencies are using technology as a competitive advantage against their rivals. Likewise, insurance agencies have been slow to use inbound marketing to generate leads. Despite drastic changes in the insurance industry like Obamacare and the continuing challenge to find affordable business insurance, most insurance agencies have been slow to use content marketing to attract new customers with inbound lead generation. Most insurance agencies have stuck with what’s familiar to feed their sales pipelines – traditional outbound lead generation tactics like telemarketing and email prospecting. While we recommend that insurance agencies introduce an inbound marketing channel to their sales process, that approach takes time to show results. 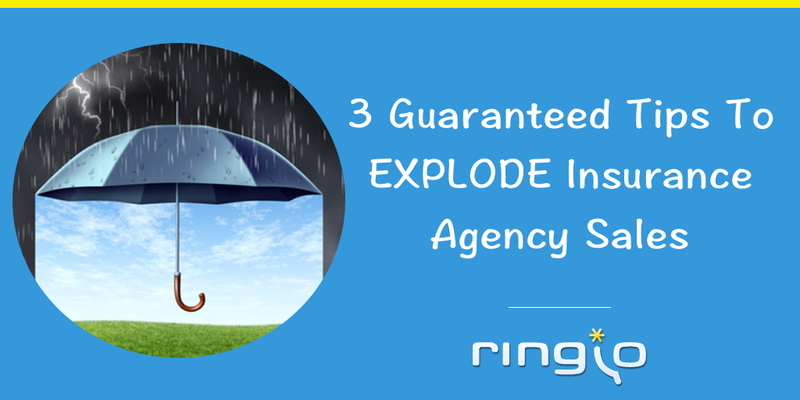 Here are 3 guaranteed tips to explode insurance agency sales now. Your top producers are successful because they are viewed as trusted advisers by their clients and prospects. They’ve earned that respect by displaying knowledge, experience and professionalism. So ask yourself this question: Is the time of my top producers best spent doing telemarketing and email prospecting? I contend that the answer is no – their time is best spent working relationships for referrals and developing their reputations as subject matter experts by speaking engagments and LinkedIn social selling. At Ringio, we are big fans of Aaron Ross’s book, Predictable Revenue. Ross was hired by Salesforce.com in the early 2000s to develop a prospecting team whose goal was to generate appointments with qualified buyers for the sales team. We recommend a similar approach for insurance agencies. Rather than waste your top producers’ time prospecting, develop a team of prospectors whose goal is to generate appointments. Your top producers likely lack the skills and time to be efficient at setting appointments. You can develop a prospecting function internally or outsource it. If you outsource your program, do your homework. Find someone with a track record of success in your industry. Measure their success by the amount of appointments with qualified leads they generate for your sales team. Your business development reps spend their time researching qualified leads and making sales outreaches to schedule appointments for your producers. 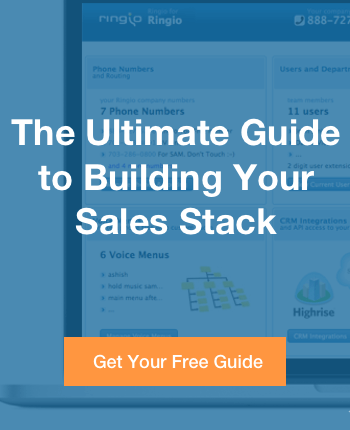 Use cloud-based sales technology to make them more effective. CRM-enabled calling platforms like Ringio automate CRM data entry and provide analytics for the Sales VP to optimize the performance of the prospecting team. Caller history in the CRM helps the business development rep customize their sales outreach and improves the calling experience of the buyer. Automated data entry provides a reliable measure of calling activity by rep for the Sales VP. Call recording lets the Sales VP review tactics and coach individual reps as necessary. Email tracking software like Sidekick, Toutapp and Yesware tells reps when their emails have been opened and when links in the email have been clicked. When used properly, reps can use this information to make timely outreach to prospects and craft conversations that speak to interests prospects have identified by their digital body language. There are many other cloud-based sales technology applications that insurance agencies can use to improve their lead generation.